Custom Wallpaper Inspiration: For the love of custom wallpaper. For the love of custom wallpaper. A blog about about custom wallpaper? Sure, it's what we do and what we love. The truth is, the term custom wallpaper is so sweepingly broad and general, it's hard to pin down the subject; custom wallpaper applications are as unique and varied as the customers who commission them. Our company, Great Wall Custom Coverings http://www.greatwallonline.com has been producing custom wall murals and wallpaper for almost 5 years. In that time, we've produced murals for clients ranging from the nostalgic to abstract, always with a keen eye for unparalleled customer service as well as print quality. As each client is different, so is each job. The fun part of our process is getting to know these clients from all around the world. Like a tattoo, there is almost always a story behind each custom wall mural. It may be to commemorate a fond memory or loved one, or a desperate attempt for an introvert to show the world that they are truly more than meets the eye. And if that aspect of one's personality needs more room to shine than a bicep or lower back, why not spread that message of individuality across an entire wall? In this blog we'll not only discuss some of our favorite projects and clients, but also our inspirations and motivations, what spurs us on to create the absolutely best custom wallpaper available. At Great Wall, we're all artists first and foremost. Some are more technically advanced while others are more visionary, but together we form a common bond, seeking to change the way we live with art. We have so many inspirations and directions, it's been hard to fit all of our ideas onto one cohesive website. In order to help bring order to our flights of fancy, we have dedicated a number of sites to more specific projects. 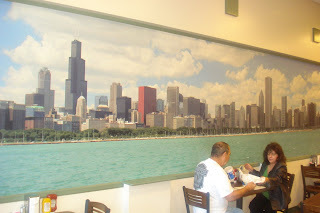 At Mosaic Tile Wallpaper http://www.mosaictilewallpaper.com we print wallpaper that looks just like real tile, in patterns, static colors, as well as murals. Our newest and favorite site is Wallgazer http://www.wallgazer.net where we synthesize a mix of music, art, and culture to create a new vision of the wallpaper mural. Wallgazer also houses a number of new patterns brand new to the wallpaper world. Please check back for more updates. In the meantime, check out or sites; we look forward to sharing more about custom wallpaper in the days to come.